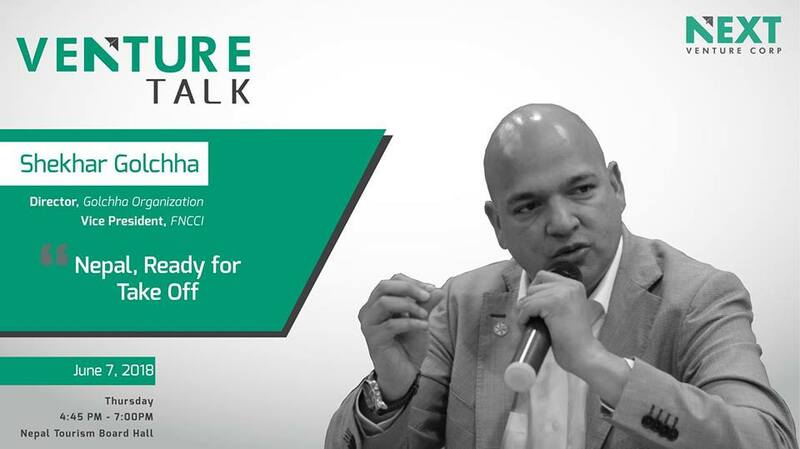 A leading entrepreneur, Director at Golchha Organization and the Senior Vice-President of FNCCI Shekhar Golchha is the next speaker for NEXT Venture Corp’s June edition of Venture Talk on Thursday, 7th June 2018 at the Nepal Tourism Board hall, Pradarshani Marg. Venture Talk is interactive talk series that features reputed entrepreneurs and experts from Nepal’s startup ecosystem and the larger business sphere. Over time, the talks have not only provided with firsthand accounts of the business atmosphere in the country, but also have been known to be a source of inspiration for several aspiring startups. Next Venture Corp encourages striving entrepreneurs, startups, or any keen learner to be a part of the two hours long event, where Shekhar Golchha will be elaborating on why Nepal has begun to evolve into what one might call an “Entrepreneur’s Paradise”, and why it is a good idea for aspiring entrepreneurs to stay in Nepal in order to launch their businesses. Starting a business in Nepal is not as risky as it sounds, and there have been several encouraging signs. Tremendous investments by the government and development agencies in the agricultural sector, a rising middle-class population with higher disposable incomes, who give rise to endless opportunities in the recreational sector, and a surge in the interest of travel from the Indian and Chinese, which has created several business opportunities in the tourism sector, are a few among several other incentives, Golchha will be talking about. The event will also feature an after-talk brainstorming session with Golchha, in which one participant will receive a chance to participate. The participant will be selected based on their answers to a survey provided after the session.